Honesdale, PA – Volunteers of Habitat for Humanity of Wayne County gathered for their Volunteer Recognition Evening on Wednesday, November 28, 2018 to present awards to volunteers for the work they have done. Habitat volunteers congregated at the Grace Episcopal Parish Hall to show their appreciation to each other and the work that Habitat for Humanity does throughout the year. Habitat President, Mark Graziadio, had the opportunity to welcome everyone and offer thanks and gratitude for the work they have done to meet Habitat’s vision - a world where everyone has a decent place to live. The highlight of evening honored Margaret Burchell as the 2018 Golden Hammer Award Winner. She is a 22-year member who has served in many positions including Board Member, Building Committee Chair, and most recently as liaison with Habitat for Humanity International and Board Secretary. Graziadio stated, “Margaret is a willing volunteer for a variety of functions and activities – even the 5K Sweeper! She is a faithful supporter of Habitat and our Mission – seeking to put God’s love into action, by bringing people together to build homes, communities, and hope – and we are so thankful that she has chosen Habitat to dedicate her many efforts to.” Prior Golden Hammer Award Winners in attendance were also applauded in thanks. Certificates of Appreciation were also awarded by Graziadio to Dan Miller for his unselfish dedication to Habitat’s mission and John & Kim Martin in thanks of pro bono legal services. Those who will receive these certificates, but were not in attendance include Willie Reinfurt, Reinfurt Excavating (demolition and site work on the White Mills Property); Jennifer Spitler (donation of her grant writing expertise); Michael Badoud (excavation work at the Ridge Street, Honesdale property); and The Catholic Daughters Court St. Martin (lunches for building crew with Ginny Motsko as representative). 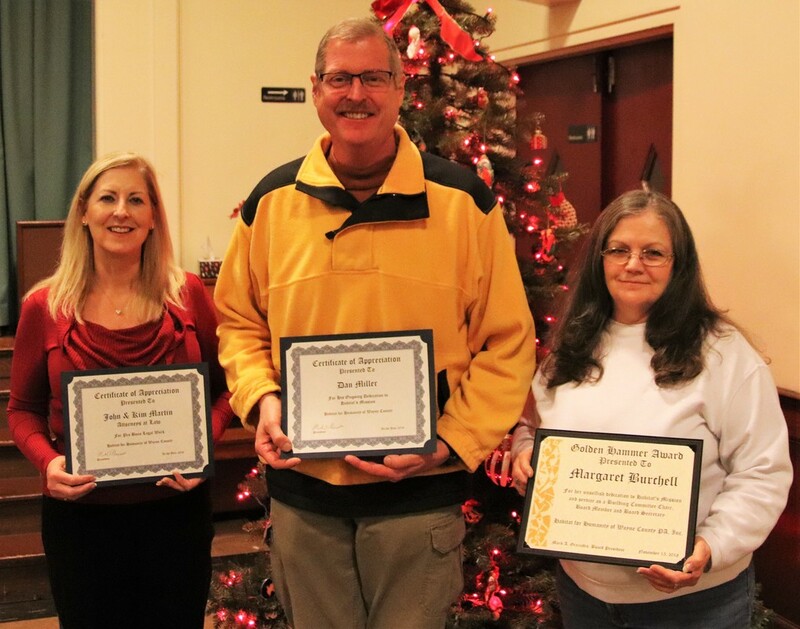 Gratitude was also shown to officers Michael Rollison, Vice President; Vicky Johannes, Treasurer; and Margaret Burchell, Secretary. They thanked board members Connie Petraitis, Event Organizer; Ginny Motsko; Diane Scarfalloto; Brad Murray; Brian Spinelli; and Paul Hartung, Board Member Emeritus. The volunteers of various committees were recognized, including Connie Petraitis, Daryl Miller, and Ginny Motsko in Family Selection; Connie Petraitis, Vicky Johannes, Janet Solkaskas, Kathy Reimer, Daryl Miller, Rob Rosco in Resource Development; Diane Scarfalloto, 5K Coordinator; Rich Bunsfield, Clyde Kreider, Paul Hartung, Tom Kulesza, John & Jan Surface, Tom Pigga, and Rob Rosco in Building; and Erica Murray, Facebook, and Sarah O’Hora, Website/Media, in Publicity. Appreciation was shown to the area churches who supplied lunches during building days, and partner families in attendance were recognized. If you would like to become a volunteer of Habitat please call 570-251-8115 or contact a current member. Three of those recognized at Habitat’s Volunteer Recognition Dinner on November 28th (l to r) were Attorney Kim Martin, Certificate of Appreciation for pro bono legal services; Dan Miller, Certificate of Appreciation for his unselfish dedication to Habitat’s mission; and Margaret Burchell, Golden Hammer Award recipient for her 22 years of service, having served as a Board Member, Building Committee Chair, and Board Secretary.